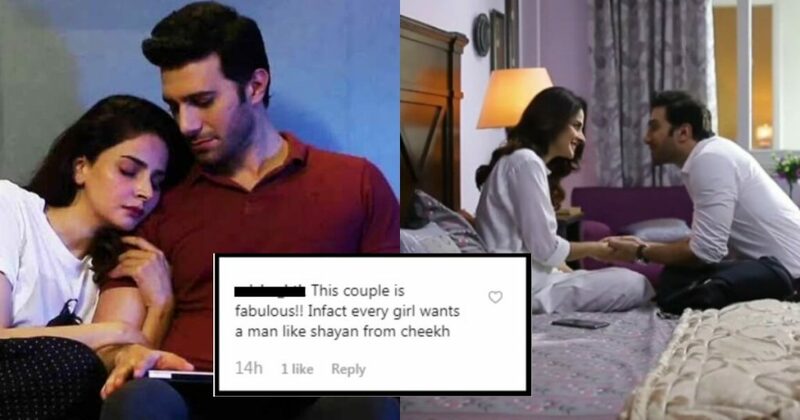 The Scene From Drama 'Cheekh' Is Making Every Pakistani Girl Want A 'Perfect' Husband Like Shayan! The Scene From Drama ‘Cheekh’ Is Making Every Pakistani Girl Want A ‘Perfect’ Husband Like Shayan! As we bid farewell to the year 2018 with some great drama serials such as Aangan, Meri Guriya, Aakhri Station, Aisi Hai Tanhai which raised social issues on the mini-screen, we have welcomed the year 2019 with even better serials. And it is good to see that viewers are no more in the mood to watch the typical saas-bahu sagas, love triangles and drama serials which portray a woman as a ‘beechari’ always! Cheekh is the latest Pakistani drama serial which everyone is following religiously these days after or before Ranjha Ranjha Kerdi! Starring the stunning actress of Pakistani media industry Saba Qamar, along with heartthrob Bilal Abbas for the first time together in the lead roles. Cheekh has an out-of-the-box story which has never been shown in the serials by past drama producers. The story revolves around a mysterious incident happened in the function of a well-reputed family of the city and to save the honor of their family, they are willing to do anything. We all know about how versatile Saba Qamar is who easily pulls off any character very easily, the other actors in the serials are just making us stunned on the other hand. From a shy boy in O Rangreza to a villain in Cheekh, Bilal Abbas’s transformation is simply mesmerizing! Wait! How Can We Forget The Brilliant Acting Skills Of Emmad Irfani As Shayan In Cheekh? The actor with brilliant looks, charming personality is none other than Emmad Irfani. However, he was well known in the industry as the successful male models but his leap onto the small screen has made him a household name now. His acting skills in Sayae Diwaar Bhi Nahen and Wo Aik Pal has made Emmad Irfani popular among drama viewers. Emmad as Shayan in Cheekh is the latest role which people are talking about these days! In the latest episode of Cheekh, people admired the romantic moments between Saba and Emmad. As Shayan has dropped Mannat at her mother’s place to save her from his brothers, he came the next day to meet her. Handing over his credit card to Mannat, Shayan told her that keep it with you to which she replied ‘Loot Lunge Me Aap Ko, Khaa Jaoge Ye Sab’. We can’t just transform all the cute moments into the words! Just see the clip of the serial by yourself. Cuteness Overload! Watch The Scene Yourself! Here Is How People Are Showering Their Love On The Couple! And Now Every Girl Wants A Husband Like Shayan! He Is The New Crush! No Doubt! Not only financially but Shayan is also supporting Mannat to tackle her emotional stress. It is good to see that Pakistani dramas are showing the ‘good husbands’ who care about their wives mental health.